What are the benefits of using a hand saw? What are the parts of a saw? What are the different types of saw? What kind of 'finish' do you want? What saw sizes are available? What saw blade lengths are available? How does the saw feel in your hand? What are the different types of saw handle? What is a saw frame? 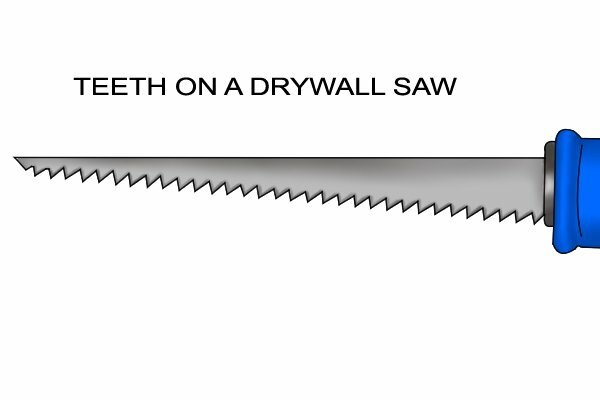 What is a saw's throat depth? What are saw blades made of? 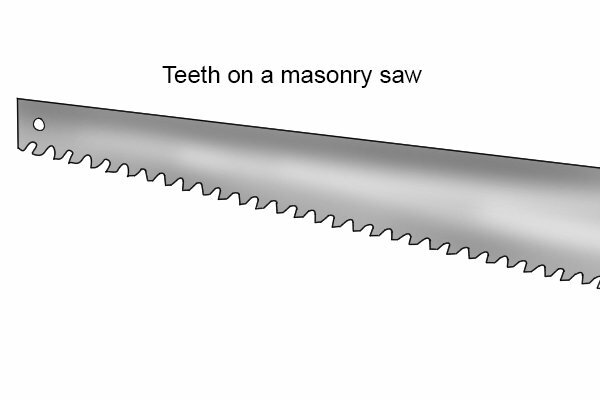 What are the different parts of a saw's teeth? What is the cutting stroke? Hardened vs. resharpenable teeth – which should you choose? What is a hand saw? What is a toolbox saw? Why do tenon and dovetail saws have a spine along their back? What is a gent's saw? What is a pruning saw? What is a Japanese or pull saw? What are the different types of pull or Japanese saw? What is a two person saw? What is a hand mitre saw? What are the parts of a hand mitre saw? What is a fret saw? What is a piercing saw? What is a bow saw? What is a buck saw? What is a plastic saw? What is a floorboard saw? What is a traditional veneer saw? 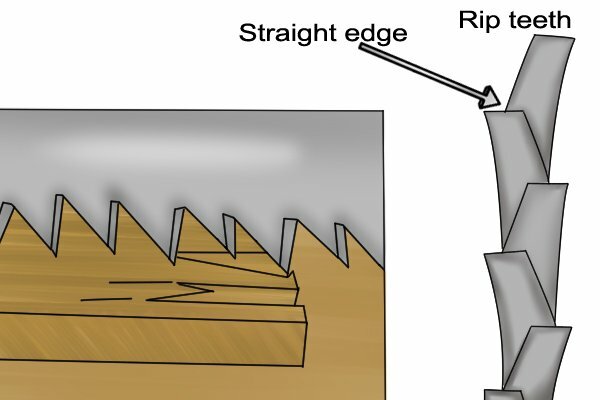 What is a double-sided veneer saw? What is an insulation saw? What is a masonry saw? What is a junior hacksaw? What is a mini saw? What is a compass saw? What is a pump-action saw? How should you store your saw? Can you sharpen a saw? What can you do to prevent damaged or broken teeth? What is binding and how can you prevent it? What is an angle guide? Is there a hand saw that will cut ceramic or glass? What is the interchangeable hand saw system? What is a combi saw? Why do some hand saws have a hole at the end of their blade? Can you reuse an old hand saw blade? 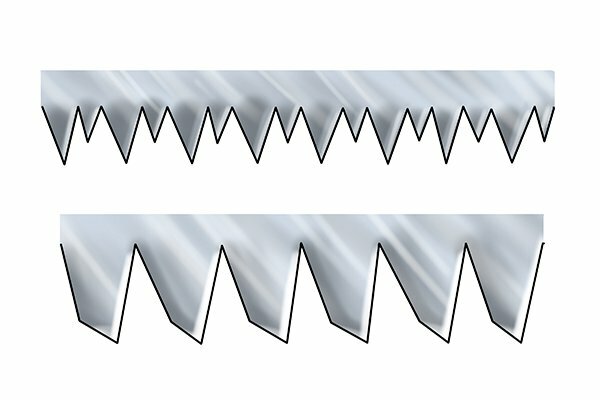 Traditionally, when saws were mainly used for woodworking applications, there were only two types of teeth found on them: crosscut teeth and rip teeth. 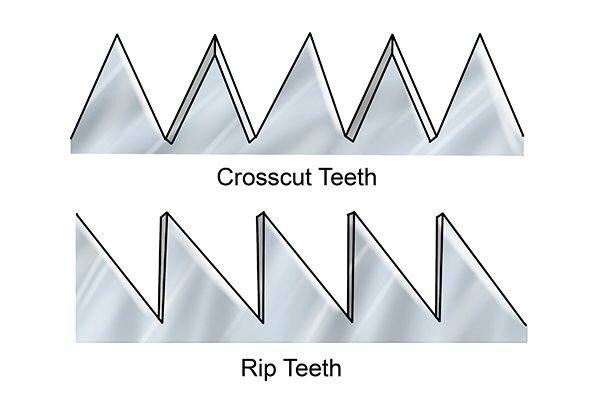 Both crosscut and rip teeth are ‘set’ (bent away from the blade) but crosscut teeth are angled on their inside edge, whereas rip teeth aren’t. This sharp angled edge means that crosscut teeth can slice through material like a series of little knives. 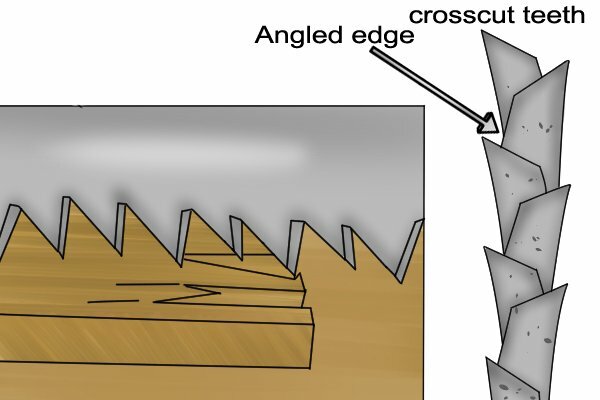 Crosscut teeth are designed for cutting across the grain of wood. This is generally considered a more difficult task, so crosscut teeth are ideal for it. Rip teeth do not have an angled edge, which means they work more like little chisels, scraping the wood away rather than slicing through it. Rip teeth are designed for cutting along or with the grain. This is generally considered an easier task, so rip teeth are ideal. 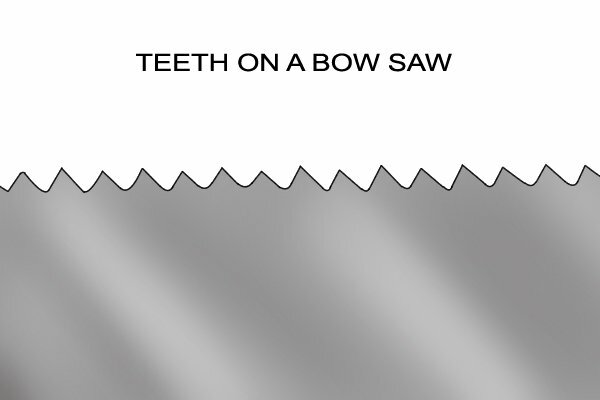 Traditionally, all saws for wood had either rip or crosscut teeth. In the last few years however, manufacturers have been able to produce teeth that can cut in any direction both across and along the grain. These teeth are now pretty much standard on most hand saws, however you will find that the design varies between brands, and each manufacturer refers to them using different terminology. Saws for cutting materials other than wood (e.g. masonry etc.) are often referred to as speciality saws. These have neither crosscut nor rip teeth in the traditional sense, though they may have some similar characteristics. These types of teeth will be specially designed for cutting into their own respective materials, and will have various features which make them ideal for that particular task.